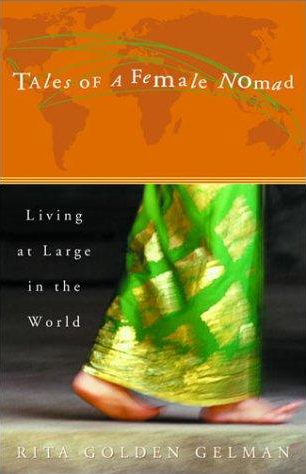 A few weeks ago I finished a travel memoir by Rita Golden Gelman called Tales of a Female Nomad. The book covers nearly two decades or her travels across the globe beginning in the early 80s and ending after the millennium. After realizing she was part of a marriage that just wasn’t working she sells most her possessions and moves to Mexico to find herself and live with native peoples. After her lengthy trip to Mexico she becomes addicted to the idea of hopping on a plane with a far away destination in mind and exploring humanity. I always knew that Americans were a less trusting group of people…but it became very evident while reading this book. I found it amazing and bizarre how she would land in an exotic land, make a friend, and would have a place to stay by the end of the conversation. Her writing style worked extremely well for me in that she knew she had a lot to write about and didn’t focus too much on any one subject. I would have to describe the book as fleeting, always interesting, and leaving the reader wanting more! I found it endearing at the end of the book where she gave readers the opportunity to email her at her PERSONAL email address. Just goes to show how very trusting and genuine she is! For all the travelers and wannabe travelers out there….it’s a good, QUICK read. Entry filed under: Book Club. Tags: Book Club, Tales of a Female Nomad. Napoletana Ugly Dog is Famous! Who’s Excited?!?!?! I think my third-world globe trotting amiga told me to read this. Two recommendations–sounds like my next read. actually I told you that your third-world globe trotting amiga would enjoy this…..however, i think you would too! Oh you did, didn’t you? Shame: I has it.